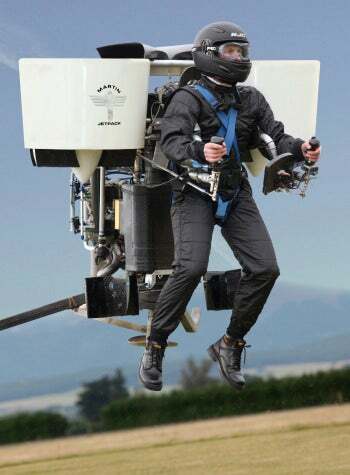 A New Zealand aerospace company has developed the world's first commercially available jetpack. It travels sixty miles an hour, can reach altitudes of a mile and a half, and you don't need a license to fly one. The Martin Jetpack bears the name of Glenn Martin, the New Zealander biochemist and tinkerer-genius who perfected the current design by building jetpack prototypes in his garage. Now, his invention will be seen in garages the world over: the Martin Aircraft Company has partnered with a national government (Martin's not at liberty to say which one) to mass-produce jetpacks and sell them to private consumers. So, like, anybody can buy one? Sort of. The Martin Jetpack costs ninety thousand dollars, so you need to have that much cash at your disposal. Alternatively, you could make a ten per cent down payment now, and pay the rest when you receive the jetpack—which, if you ordered today, would happen about a year from now, according to the M.A.C. Web site. Keep in mind users have to fall within a certain weight range—between 140 and 240 pounds—in order to safely pilot the jetpack. Some other jetpack facts (or "jetfacts"): Martin's jetpack runs on the same gasoline pumped at any gas station. It's about five feet tall, wide, and long—as seen in this demo video, you stand in position, put your hands on the pitch/roll and yaw/throttle controls, and lift into the air. There's a parachute built in, and if you take your hands off the controls, the jetpack will automatically stabilize and you'll hover in place. (Note to self: Buy curtains.) The pack will get you about eight thousand feet off the ground, with a horizontal distance range of about thirty miles and a top speed of about sixty mph. Weirdly, the Martin Aircraft Company Web site mentions nothing about an ignition key, so if you use a jetpack to commute to the office, it's not clear how you're supposed to stop people from absconding with it during business hours. Maybe invest in a good bike lock? Or maybe jetpack joyrides are just something we'll have to get used to. The future is going to be an interesting place. Photo courtesy of the Martin Aircraft Company.